Successfully Added 15.6 Inch Portable DVD Player - 270 Degree 1366x1280 Swivel Screen, Region Free, Anti Shock, USB, SD, AV, Game Emulation to your Shopping Cart. The 1366x1280 wide screen view displays movies in all their glory without distortion or cropped boarders, so all you get is crystal clear viewing. Thanks to the anti-shock function this DVD player won't be interrupted so even if you're on a bumpy journey or experiences some turbulence on your flight you'll be able to enjoy uninterrupted quality viewing. This unit can play just about any CD or DVD with support for a wide range of discs and formats. The region free, (also known as region zero), DVD player can play your movies from any corner of the world so regardless of where you purchased the disc this player will support it. If movies aren't your going concern then fear not as this DVD player has entertainment for everyone. Tune in to your favorite shows with the TV antenna, Play classic 32 Bit arcade games with the NES game emulation or enjoy music with the FM radio functions. It can do them all. To ensure the best viewing angles for everyone this player has a 270 degree swivel screen letting you share the fun with others. you can also load content from the SD card slot or USB flash drives and with the copy function you can make backups of your favorite tracks. With its built in stereo speakers and audio output port you can enjoy great quality audio and really get the party going with your favorite tunes. 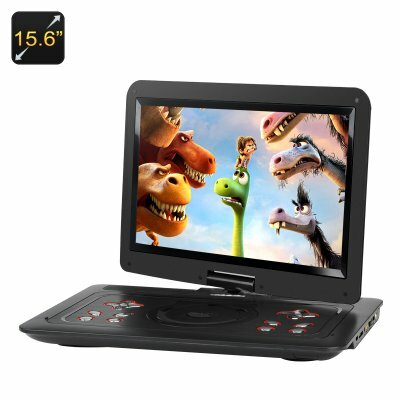 This 15.6 inch portable DVD player comes with a 12 months warranty, brought to you by the leader in electronic devices as well as wholesale portable DVD players.. The screen allows for a rotation of 270 degrees.